Protestant stoles are a type of liturgical vestment that consists of a broad band of colored cloth. The stole is typically around 7 to 9 feet long and may be around 3 or 4 inches wide. Protestant stoles are worn around the neck, with the ends extending to the front of the wearer. The ends of the stole often hang down independently, though connecting designs are not uncommon. The stole is almost always decorated in some way. Crosses, crowns and other biblical symbols are typical types of decorations. Fringe extending form the ends of the stole are also popular. Our reversible styles feature different colors on either side of the piece, but the decorative elements are the same on either side. 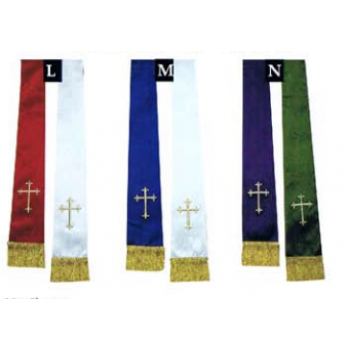 Clergy stoles for Protestants are frequently made in liturgical colors including white, green and purple. The color of the piece worn is often coordinated with the liturgical season, enhancing the meaning and message of the service while providing a physical connection between the person wearing the stole and the spirit of the season. For the best selection of Protestant stoles at affordable prices, choose to shop with Matthew F. Sheehan. Our stoles are selected for their quality and design, so you can rest easy knowing you’re getting a piece that will last for years to come.